Purtzer Golf Instruction and Schools - located in beautiful Phoenix, AZ. Learn how to swing like Tom Purtzer, often credited with having the "Sweetest Swing in Golf". Learn to take advantage of your good swings and how to save yourself from bad ones. Learn how to score better and enjoy golf more just by making better decisions before you play and between shots. Don't let your mind hold you back on the golf course any more. Learn how from instructors who have played on golf's greatest stages. Are you looking for the perfect Arizona golf vacation, Arizona golf school academy or executive golf instructor for your next corporate event tournament or golf outing? 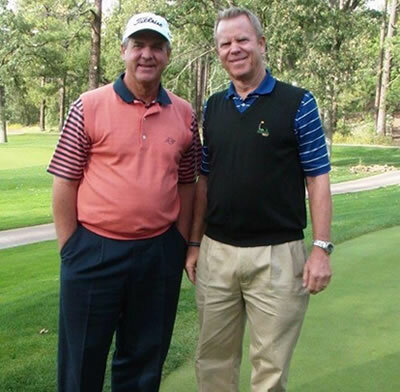 See why more junior golf hopefuls and corporate executives choose PGA Professional Paul Purtzer and former PGA Tour Professional and current Champions Tour Professional Tom Purtzer. At Purtzer Performance Golf School and Academy, we're dedicated to providing you with the ultimate golf school experience at any age and any skill level. Our golf school and academy in Arizona has trained many junior golf hopefuls by using the same PGA level golf instruction techniques used by our instructors to exceed your improved playing objectives. Let us design a customized instruction plan tailored to your needs and watch your golf game scores improve immediately. So please contact us now to begin planning your Arizona golf school. Even if you haven't decided on where you are planning to vacation, we'd still like to talk with you. We're confident that of all places to visit looking for a great golf school Arizona is at the top of the list. As a former PGA Tour player and now a PGA instructor, I know a good takeaway is an important part of a successful golf shot. Many golfers struggle to have good rhythm when they hit their shots. This tip should help that and get you in position to be more consistent. During my competitive career, I had a number of chances to win tournaments and developed a few keys that really worked well when I was coming down the last few holes with a chance to win. One of those keys was to concentrate on getting my left shoulder to my chin (note-I did not say getting my chin to my left shoulder) and to make sure to get my right shoulder to my chin on the forward swing. Before I go any farther, make sure your posture is good and that your chin is not down in your chest at address. You want to have your knees only slightly flexed and tilt to the ball from your hips-back and neck in a straight line. Paul PurtzerCHRISTMAS/NEW YEARS CAMPS - Purtzer Golf Academy announces PARENT & CHILD GOLF CAMPS Dec.26-28, 2014 and Dec. 29-31, 2014. As junior players, college golfers and PGA Tour Players, my brother Tom and I worked extremely hard on our fundamentals-a good grip, posture, stance, alignment, ball position, tempo, takeaway, backswing, forward swing-not to mention the short game. Doing all these things well makes it easier to hit the ball well as possible and become top-flite players. My time on the PGA Tour was a fantastic experience even though it was cut short due to injuries. I learned a lot from competing with the best players in the world. One of the things I realized was: the great players spend a lot of time on their short games-putting, chipping, pitching and sand shots. Many of the established PGA Tour Players spent a lot of time practicing the chip-and-run shot with a 6, 7 or 8 iron -even though we would not hit the chip shot very often during our round. I first thought-WOW what a waste of time, but I finally figured out that those chips shots were not only sharpening their short games, but helping them to hit all their shots better-short shots and full swings. On the chip and pitch shots, your weight is on your left side, your right foot/knee begins the forward motion in your stroke, and hands are ahead of the ball at address, and impact-just like you do for 90% of your full shots. Paul PurtzerThe Deadline for our upcoming Junior Golf Advanced Players' camps has been extended to fill our last remaining spots before its too late. Please visit our Advanced Players Camp page for more information. You can also download the Registration here.